In December 1833, Cork barracks was the setting for a court martial that drew crowds of spectators, and whose proceedings were published in papers across Britain and Ireland. Lieutenant-Colonel Lord Brudenell,1 the officer commanding the 15th Hussars, had pressed 6 charges against one of his officers, Captain Augustus Wathen. Three of these charges were for ‘conduct unbecoming to an officer and a gentleman’, which included dissimulation, disrespect and dissent, while the other 3 were for outright impropriety and disobedience. Even before the court martial was convened, the personal conflict between Brudenell and Wathen had been reported on in Cork local newspapers.2 Such was the media coverage of these disagreements that prior to the sitting of the court martial the Freeman’s Journal commented that ‘Captain Wathen has become – and he can’t help it – excessively popular’.3 But how could the officer accused of refusing to obey orders become a popular hero? Court martials of soldiers, NCOs and officers frequently featured in local and national newspapers, but few achieved the notoriety of this one. It was a military trial with a number of compelling narratives: aristocratic privilege, honour and the abuse of power. The parties involved – Lord James Brudenell and Captain Augustus Wathen – represented two competing visions of military men. Lord Brudenell (he was to become the 7th Earl of Cardigan) was an extremely rich aristocrat with little military experience who had bought the command of the 15th Hussars in 1832 for about £20,000.4 Captain Wathen, not being rich enough to purchase command, earned his rank the unglamorous way. From a military family (his father was Major Augustus Wathen), by 1833, he had spent 20 years in the army, and was a veteran of Waterloo.5 While Wathen was married to Lady Elizabeth, a daughter of the 13th Earl of Rothes, Brudenell had married Elizabeth Johnstone, with whom, when she was Mrs Johnstone, he had conducted an affair. The scandal of Lady Brudenell’s past was partly to blame for the tension between Brudenell and Wathen, whose wife was believed to have snubbed Lady Brudenell.6 Thus the virtuous, hard-working, if well-connected, Wathen was arraigned by the scandalous, aristocratic, military dilettante Brudenell. In a decade where the burning political issue was the reform of the electoral law Brudenell embodied entrenched aristocratic privilege, whose money and connections surpassed his ability and moral stature. For newspaper readers, this was a delicious story. Since the military court-room was open to the public, it was an irresistible draw for the ‘respectable Citizens’7 of Cork, who crowded into the room for 18 days of evidence and cross-examination, chatting, murmuring and reveling in the ‘sensation’8 caused by some evidence, even though the fine details of troop debt, stable jackets and equine health were often opaque. Each day, apart from one day of very inclement weather, the court room was ‘excessively crowded, particularly with civilians.’9 The audience was an emotional participant in this trial, reacting to Wathen’s appearance on the sixteenth day with ‘a loud buzz of sympathy’.10 It was clear where the public sympathies lay, for when Wathen delivered his personal testimony (rumored to have been written by his wife)11, ‘an irrepressible and enthusiastic cheer broke forth’ when he mentioned his service at Waterloo.12 Adding to the personal and political interest of the trial was the pageantry that attended a military court. Fifteen military judges, all resplendent in the full-dress uniforms of their respective regiments, faced Brudenell and Wathen, both dressed in the glittering uniform of the 15th Hussars, with pelisses and fur trimmings. The panoply of lace, braiding, shining leather and rich fabrics heightened the drama of the occasion as well as providing a diversion when the evidence became tedious. 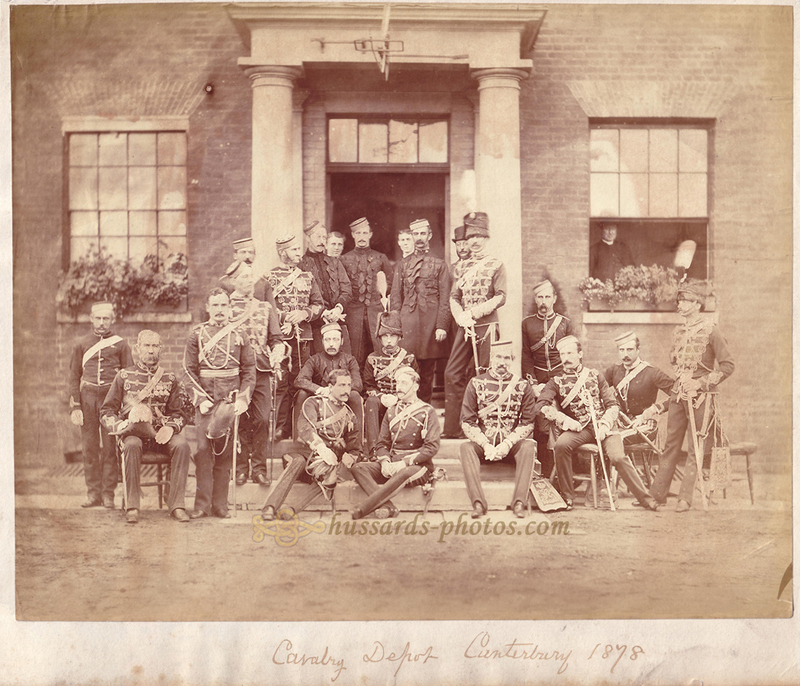 There are no images of this court-martial to illustrate the glory of these uniforms but I think that this photo of the Cavalry Depot staff in 1878, showing a variety of ranks and regiments, gives a flavour of the peacock pageantry of cavalry officers. A local newspaper, the Southern Reporter, printed full minutes of every day’s session, and these were reproduced across Britain. The real story, as appreciated by the Southern Reporter, was a human one about the exercise of authority, or rather its apparent abuses by the officer commanding, Lord Brudenell. Wathen had been arrested in September 1833 but the Horse Guards (the term for the London headquarters of the Army) had decided that there was insufficient grounds for a court martial. But Wathen was convinced that he was not safe from his commanding officer’s vindictive nature and his fears were realised in November when Brudenell again arrested him. This time London decided that Wathen should stand trial. What Lord Brudenell did not anticipate was how his command would be scrutinised during the trial. For every allegation of mismanagement Brudenell laid at Wathen’s feet, his captain endeavoured to show how the commanding officer was ultimately responsible. At the heart of the court martial was the alleged mismanagement by Captain Wathen of his troop and specifically, their finances. Wathen’s troop had incurred a large debt by purchasing large numbers of stable jackets, the uniform worn daily by the men while exercising and working the horses. Brudenell alleged that this was a symptom of Wathen’s poor officership but Wathen showed that his debt was not exceptional, revealing Brudenell’s prejudice against him, but more importantly, how the debt was unavoidable, given his commander’s penchant for new uniforms. Brudenell was undoubtedly obsessed with new uniforms. Under Thackwell’s command, from 1827 to 1831, 21 stable jackets were issued. In the year since Brudenell had assumed command, 80 jackets had been ordered.13 There was a set amount allowed for uniform expenditure but, under Brudenell, it was difficult for a troop not to exceed its budget. In general, an officer commanding a troop took decisions on clothing and equipment, but Brudenell had taken this responsibility into his own hands, inspecting the men himself and ordering new clothing from the regimental tailor.14 The injustice of blaming an officer for excessive debt incurred as a result of the commanding officer’s decisions became clear as the court martial proceeded. But Brudenell’s case was truly lost when it emerged that he had secretly engaged an NCO to make notes on the conversations between himself and his officers. By spying on his brother officers, Brudenell had spectacularly breached the code of ‘an officer and a gentleman’. It was no surprise when, in March 1834, Wathen was cleared of all charges. What was astonishing was that Brudenell was removed from the command of the 15th Hussars. This was a severe reprimand and it was delivered in a General Order which was ‘read at the head of every Regiment in His Majesty’s Service’.15 Across the British Empire, from gloomy granite barracks in Britain to sweltering parade grounds in India, the General Order clearing Wathen’s name and condemning Brudenell’s conduct was read to every soldier and officer. The Order was also reproduced in newspapers across Britain.16 Even the Times approved of the censure, believing that Brudenell’s practice of setting NCOs and soldiers to spy on their superior officers endangered the ‘discipline, efficiency and honour’ of the British army.17 It was a very public disgrace. It seems unbelievable that a clothing bill could have provoked a sensational court martial that brought down a commanding officer but uniforms and appearance were fundamentally important to the British army. Brudenell emerged during Wathen’s court-martial as a petty, vindictive martinet, willing to manipulate the army’s disciplinary process to persecute an individual he hated. Though the extremes to which Brudenell took his feud with Wathen was unusual, his attention to sartorial detail was not. Officers who loved uniforms and drove their men to achieve a neat appearance above all else were called ‘pipe-clay soldiers’18 after the substance with which soldiers whitened leather. Such officers believed that a glorious appearance was the signifier of military efficiency. Some took it to ridiculous extremes: an officer commanding the 16th Lancers, the only Lancer regiment wearing red jackets, attempted to recruit only red-haired men and insisted that they be mounted on chestnut horses.19 On a serious level, this fascination with fancy uniforms was dangerous: in 1865 an army committee concluded that a soldier’s kit, designed primarily to look beautiful, contributed to the rates of heart and lung disease in the ranks.20 Far too often the officer class of the British army treated the human beings under their command as toy soldiers to be dressed according to their whims. In many ways, Brudenell was simply the distillation of the worst aspects of the British military system. The regimental system produced some odious petty tyrants, as the weak central control over the army fostered regimental independence in all forms. Just as distinguished and thoughtful officers such as Sir Charles Napier commanded according to their morals and principles, so too did men of Brudenell’s ilk. And Brudenell was the archetypal aristocratic officer. Although mortified by the General Order of 1834, he and his relations lobbied the King and the Horse Guards so well that in just 2 years, he was given command of the 11th Hussars. Once again, uniforms came to define his command. After escorting Prince Albert on his arrival in Britain to marry Queen Victoria, the regiment was renamed ‘Prince Albert’s Own’ Hussars. To Brudenell’s delight, Albert became Colonel of the regiment and designed their new uniform. Kitting out the entire regiment in this magnificent new uniform reputedly cost Brudenell £10,000 of his own money. Resplendent in red trousers with a yellow or gold stripe down the side, the regiment was dubbed ‘the Cherry Bums’. Even among the peacocks of the British army, the uniform of the 11th Hussars was dazzling. However, Brudenell remained a controversial figure, falling out with his officers and scandalising public opinion by having a soldier flogged on Easter Sunday, just half an hour after divine service had ended. He did not see military action until the Crimean War, when he infamously led the Charge of the Light Brigade to its doom. He was also the first man to return from the fray, leading to accusations of cowardice and further public opprobrium. Eventually, Brudenell made an enduring mark on fashion but not until 1868, the year of his death, when the ‘cardigan’ first appeared.21 James Brudenell, the 7th Earl of Cardigan, is now associated with an informal, woolen garment, a piece of clothing bearing no relationship to the tailored, tight, embellished uniforms that defined his military career. This entry was posted in Augustus Wathen, Britain, Cavalry, Co Cork, Court Martial, Crimean War, Earl of Cardigan, History, Ireland, James Brudenell, Lady Elizabeth Rothes, Military, Scotland, Urban. Bookmark the permalink.